Lower yields could also be because the cloves, planted in spring, must put energy into growing both leaves and roots. Roots grow whenever soil temperatures are above 40 degrees F., so fall-planted cloves start growing roots immediately. And for quite a while because, with the ground cooling more slowly than the air, balmy weather lingers long in the soil in fall, especially when it’s covered with an insulating layer of wood chips, compost, straw, or other organic mulch. My reasoning for late summer planting rather than fall planting is that the sooner the bulbs are in the ground, the more time roots have to grow before temperatures drop consistently below 40 degrees. More root growth now means more roots to fuel leaf growth in spring which, in turn, means bigger heads to harvest next summer. More root growth also means that cloves are more firmly anchored into the ground through winter, so are less likely to heave up and out of the ground as it freezes and thaws. The caution against planting as early as I suggest is that leaves might awaken and push up through the ground in fall, only to be snuffed out by winter cold. True. But garlic is a monocotyledenous plant, so its growing point, like that of other “monocots” (such as lilies, onions, grasses, orchids, and bananas), lies beneath the ground, protected from cold. The usual recommendation for garlic planting is to plant early enough to allow time for some root growth but late enough so leaves don’t appear aboveground. Leaves peering above ground in fall might even help spur root growth, at least once they start exporting energy. (Their initial growth is fueled by energy reserves in the planted clove.) Even if winter cold kills the leaves, they will have done some good if they begin growth soon enough. The sloppy mess of frozen leaves could, admittedly, breed unwelcome bacteria or fungi. Biological systems are complex, and plants don’t read what I write and may not follow my reasoning. Just to check, I planted only half of my garlic bed; I’ll plant the other half in a month, the recommended planting time. Next summer I’ll know if my garlic cloves followed my reasoning. 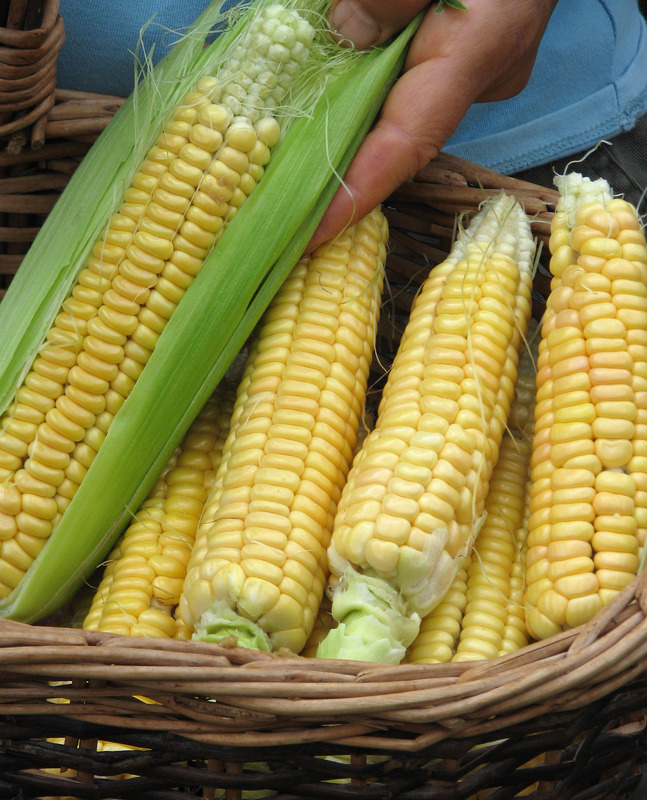 Garlic is for the future; sweet corn is for the present. 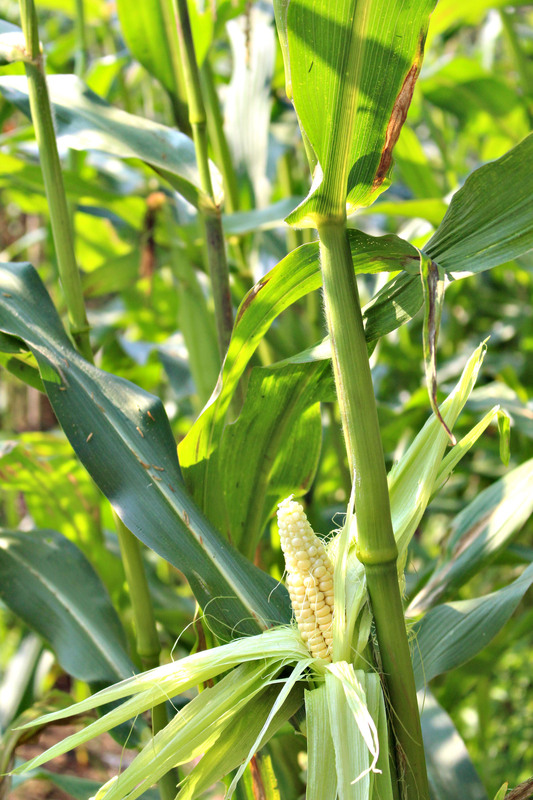 Whoever it was — and there were plenty of those “whoevers” — that recommended against growing sweet corn in a small garden because it wasn’t worth the space did a disservice to gardeners. My garden isn’t all that big yet we’ve been harvesting all the sweet corn we can eat and freeze since early August and will continue to do so for much of this month. 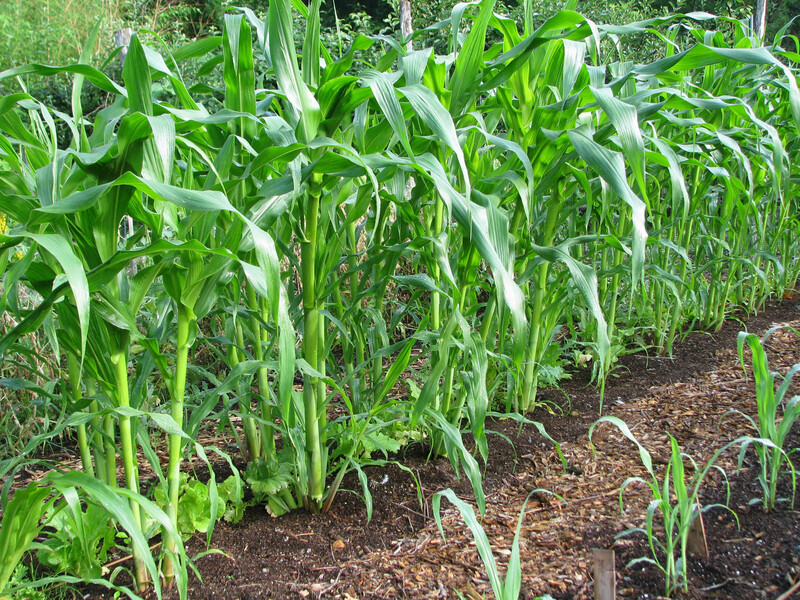 Sweet corn can share a bed with other vegetables, lettuce here. My vegetable garden is in 18 foot long, 3 foot wide beds, and I planted 4 beds at two week intervals from early May until the third week in June. I sowed the seeds sown in hills (clumps) to end up with 3 to 4 plants every two feet in a double row running down each bed. Planting in hills provides better pollination and resistance to wind than planting rows of single, more closely spaced plants. Each stalk yields one or two ears, so a conservative 1.5 ears per stalk and 3 plants per hill computes to yields of 81 ears of corn from each of four beds. That’s a lot of sweet corn! And not just any sweet corn, but Golden Bantam Sweet corn, the standard of excellence in sweet corn a hundred years ago. You can’t buy ears of this variety these days. It’s the only one I grow. Pumping out all those delectable ears requires good growing conditions. To whit: Very fertile, well drained soil; water as needed; and little competition from weeds. I slathered the beds with an inch or more of compost in spring and all summer plants’ thirst has been daily and automatically quenched with drip irrigation. up the middle of the second planting shortly after the corn emerged and is doing fine now that the corn has been harvested and those plants cleared away. I’m still trying to figure out what to plant to follow the third planting, which is just finishing up. I also grow popcorn, but that’s another, also delectable story. This entry was posted in Gardening, Planning, Soil, Vegetables and tagged garlic, Golden Bantam, popcorn, stinking rose, sweet corn. Bookmark the permalink. Trackbacks are closed, but you can post a comment. A professional garlic grower explained the early garlic question at his presentation last weekend (Mother Earth News Fair): garlic will survive being nipped back by cold weather twice, but the third is usually fatal. So, I figure I’m safe planting mid to late September in my micro-climate, and past experience has borne this out. I’d like to know where the “professional” grower got this information; probably on his own “back forty,” which may or may not be valid. (It may not be valid everywhere, or other things might also have been at play when he made that observation. Nothing I saw in the published literature said anything about the “third nip” rule. Not too be contrary, but don’t believe everything you read or hear (except from me — just kidding). I’ll report on my garlic findings at a later date, and comment on the limitations of my observations. You’re right, the garlic grower was Ron Stidman of Enon Valley garlic, and he presented his “third nip” as a rule of thumb from his own experience with a number of different varieties. Not a trained horticulturist, but he had enough personal experience to make a nice presentation. He did share a good bit of his early mistakes, and how Cornell pulled him out of some tight spots. I didn’t catch him say anything that was contrary to the recommendations I’ve gotten from PSU Extension. So no damage even after green sprouts get frosted. If you had the time, you might sometime try planting even earlier. I read your corn planting with interest as I was “taught” not to bother with corn. 81 ears is a plenty! And it sure looks delicious. I hope you post about popcorn, too. I tend to follow the “plant garlic after the first frost” rule but now, well we had our first frost! Last year our first frost was Oct 29. (Or mine I should say as I like to record it on a wall calendar each year. I then hang all the calendars together so I can compare dates over the years. I mostly record bird sightings but frost and bloom dates are also helpful.) So, now what? It is supposed to be 70 F today. I think I will go with my gut and plant. I tend to grow and plant by some sort of inner intuition and its usually quite accurate. What type(s) of garlic do you grow Lee? I grow Music garlic and possibly some others. I have to admit to not putting a lot of effort into my garlic plantings. I know this is almost sacrilege these days, but I’m not a big fan of garlic. I’m always amazed at the sometimes fairly small gardens that give over a lot of space to garlic. I’d opt for mote tomatoes, peppers, peas, and lettuce. planted with crops underneath is a great idea. I’ve got a small garden and always shied away from corn. might even try sunflowers with adequate space to grow underneath. thanks! I tend to start my garlic early as well–usually mid Sept.
You might be interested in this post that softneck garlic does not grow well in the north. I planted corn for the first time this year, and the variety I planted is Golden Bantam. Although I got a good harvest, I’m less than impressed with the taste. I think, perhaps, that the problem is that I had a really difficult time knowing when they were ready to harvest. Most of the ears were starchy, so I’m assuming I waited too long. And then I’d try to be careful not to leave them on the stalk too long, and I’d end up with immature corn. Help! What are your tips for knowing just the right signs that they are ready to harvest? Harvesting corn at the right time is an art that gets easier with practice. Check out the tassels. They should be just about dry. Feel the ear in its husk. It should feel plump. Pull back enough husk to get at some kernels and push them with your fingernail. A milky juice should come out. And finally, harvest an ear and taste it. It should be sweet with rich corny flavor — but definitely a lot less sweet that all the new super sweets. After a couple of years of observation and testing, you’ll have mastered the art. One of the main reasons I plant corn in my home garden is to reap the taste advantage of eating it minutes after it’s been picked, since supposedly the sugars start turning to starch immediately. As a result, I also plant a very sweet variety (Trinity last year, from Johnny’s). Is there a reason that you’re not interested in taking advantage of the new super sweets, and instead opt for the classic variety? What trade-offs am I not considering? By the way, I just got Weedless Gardening last week and finished it in a week. Fantastic book, thanks so much for writing it! I don’t like the super sweet flavor. I find old fashioned corns to have less sweet but richer flavor. I know you are an advocate of no-till methodology, particularly for preventing activation of weed seeds. 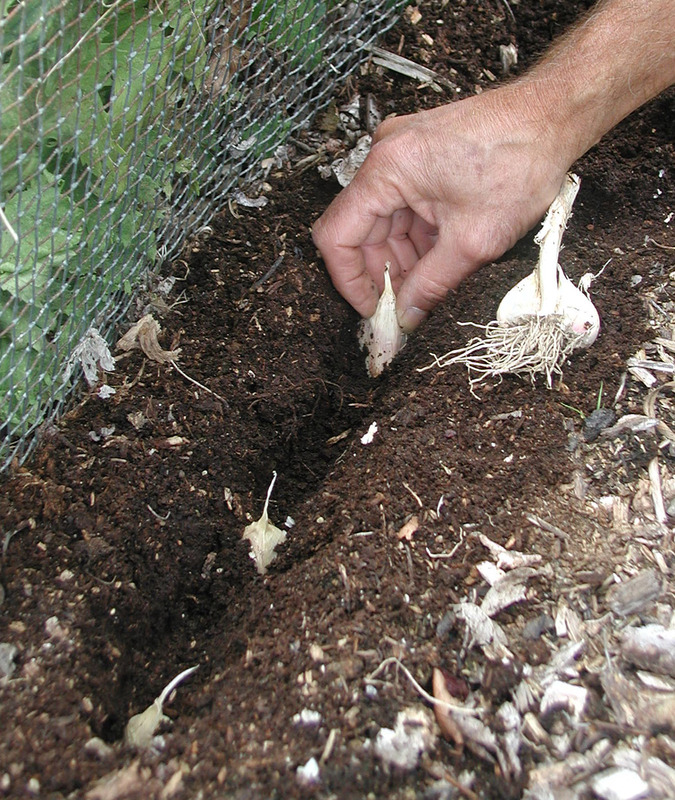 It seems inevitable however when planting garlic that soil must be moved to plant the cloves at the proper depth. Any tips from a no-tiller on how best to do this? Should I create small furrows as I usually do, or something else? Sure, just disturb the soil minimally. A furrow whereby the soil is pushed to the side and then replaced is hardly tillage. I have planted garlic for 30 years, from New York’s Finger Lakes to Rhode Island,(yes, near your brother’s weed beds…) for love, profit, science and literature. I have never had any damage from frost, winter kill, etc. The only time I have lost garlic is when I did not plant it. I count it, right along with Jerusalem artichokes and Horseradish as one of three crops that cannot fail. I often surprise even myself with the amount at harvest. I planted Roy’s Callais Flint corn in NH, and had a good harvest, so I planted a second year. I’m doing this in mounds, not rows. Ok, problem is that the second season the earth was filled with rootworms so that by July the corn was topping over because the roots were weak. I read that the solution is to plant in different places every other year. However, I noticed that the hills where I planted garlic along with the corn were not affected by rootworms. Do you have any no-how about garlic killing root worms? I guess maybe in the modern world the sister plant for corn is garlic. I read that in Abenaki times they did not have these root worms, they are an import. How aout making it Four Sisters, including garlic in the planting. But corn should e rotated every year, as should other vegetables.